Has Bangladesh learned lessons from Rana Plaza tragedy? Editor’s note: Alyssa Ayres is senior fellow for India, Pakistan, and South Asia at the Council on Foreign Relations. She served as deputy assistant secretary of state for South Asia during 2010-2013. You can follow her @AyresAlyssa. The views expressed are her own. 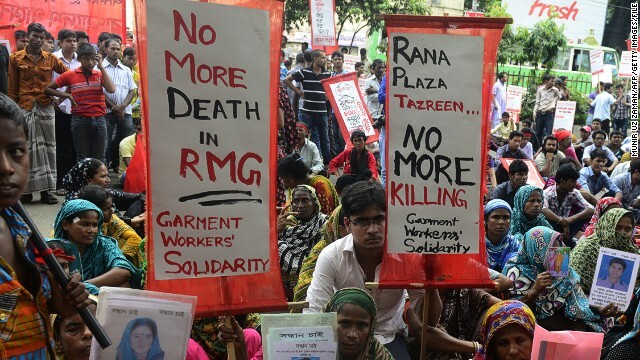 Today marks the one-year anniversary of the Rana Plaza tragedy in Dhaka, in which more than 1,100 workers perished when the concrete building they were working in collapsed on them. The accident – the world’s worst in the garment industry – focused Bangladeshi minds on the urgent need to improve workplace safety. It also compelled governments, especially the United States and EU, as well as international buyers and retailers sourcing from Bangladesh, to address the issue, resulting in several important public-private commitments to support better working conditions in Bangladesh. But a year later, despite substantial improvement in raising wages and getting factory inspections underway, progress remains patchy. Indeed, it is increasingly clear that unless Bangladesh moves quickly to truly transform safety conditions in the garment industry, buyers will shift their orders elsewhere. No one who has seen the poignant image of the Rana Plaza couple uncovered from the rubble, embracing in death, can remain unmoved by the tragedy that befell so many workers. But this association of Bangladesh with factory tragedy has overshadowed arguably the most important lesson of its garment industry: despite its clear problems, the ready-made garment (or RMG) sector has contributed handsomely to Bangladesh’s economic growth, and provided livelihoods for some four million Bangladeshis, mainly women. Bangladeshis refer to their focus on export-driven employment as “trade, not aid,” and garment exports account for nearly 80 percent of the country’s total, according to the latest figures from the Bangladesh Garment Manufacturers Export Association. Certainly, the Bangladeshi spirit of entrepreneurship took this sector from a few hundred factories employing 120,000 people in 1984, to more than 5,600 factories employing four million by 2013. Thanks in part to garment exports, Bangladesh’s economy has grown at around 5 to 6 percent annually for most of the past twenty years, and has emerged as the world’s number two garment exporter, second only to China. Contrast this with Pakistan’s chronic woes, and this South Asian success story shows how a focus on entrepreneurship, economic activity, and employment delivers real gains to citizens. Yet Bangladesh’s rapid growth took place in a context of relatively limited inspections and often porous governance. The owner of Rana Plaza, currently in jail pending trial, allegedly evaded zoning regulations by taking permission to construct the building from a municipal body without the authority to grant it. He also allegedly added additional stories, illegally, to the structure. Even when large cracks appeared in the building, factory owners reportedly insisted that workers stay on the job. It’s precisely these problems that Bangladesh’s new labor law, combined with the Bangladesh Accord on Fire and Building Safety, the Alliance for Bangladesh Worker Safety, and the EU-Bangladesh-International Labor Organization Sustainability Compact, all promise to redress. Since last April, Bangladesh has raised wages some 79 percent in the garment industry, to a total of $68 per month, and allowed unions to form. Major European and American companies have signed onto the Accord and the Alliance, and begun intensive factory inspections along with offering suppliers substantial financing to make needed repairs. Through Bangladesh’s actions on its labor law, it at last became eligible for an ILO-IFC “Better Work” program, which entitles it to factory compliance assessments, training, and expert advice. This is all good news, but much more remains to be done. Last month, factory inspection reports released by the Accord have detailed failings such as inadequate (non-fire-rated) doors and collapsible gates with locks along fire exits, insufficient sprinkler systems, and loads too heavy for building structures. Inspected factories supplying companies signatory to the Accord and the Alliance are asked to undergo targeted remediation to meet safety standards, which will be an intensive focus in coming months. At this point, Bangladesh needs to move faster to redress safety problems. Its garment exports are slowing – with year over year growth in January (7.1 percent) at one-quarter of that tracked in November, according to Reuters. Some of this is attributed to higher wages, but a reputation for poor safety standards doesn’t help. Indeed, even before the Rana Plaza collapse, following a factory fire in November 2012, Disney revised its licensing guidelines such that Bangladesh (among other countries) no longer appeared on their list of permitted sourcing countries. With short global business cycles and ethics a crucial part of brand identities and consumer awareness, Bangladesh cannot afford to lose retailers’ confidence that the industry can safely source from its factories. While structural flaws in buildings will take time to fix, a year after Rana Plaza inspectors should not be finding inadequate fire doors – the most basic and known required safety standard. Bangladesh is racing against a fast-moving, highly globalized sector, and failings will send the market a signal to diversify elsewhere, as appears to be happening. Only if Dhaka can shore up “Brand Bangladesh” to signal quality garments produced in safe conditions will the Rana Plaza tragedy have proven to be the catalyst necessary to make the changes for future entrepreneurial success. That’s what the victims deserve. Workplace place accidents are must happened, everywhere. Whether, the Nuclear accident in Ukraine or daily kitchen fire elsewhere. However, since Bangladesh is a poor Country and its People are living in poor conditions, Walmart supposed to inspect and provide what was needed, to prevent the accident. Q: Why do tea party patriots always wear size 34 floppy clown shoes? A: Because they are more dignified looking than the size 42's. That sounds like the period when America's productivity was growing long ago, and there were jobs, jobs, jobs. Folks forget things. Remember that fire in Manhattan? Wasn't that a Triangle Shirt Company, or something like that? How's that job search working for ya? Imagine this announcement from a USA president; "we added 5,000 new factories and four million new jobs." Or was that 5,600 new factories? Lots of them, anyway. What we need is more government inspections, and intensified focus on Climate Change..
For Bangladesh it's all about survival. If it doesn't offer lower prices, customers will move to countries with cheaper labour. It's not about whether Bangladesh has learned from the tragic incident a year ago, we have to ask ourselves whether we have learned too. Yet many of us are quite indifferent to the tragedies and grievances of third parties, as long as we are not affected.